Public space is an integral element of a city. Its appearance and functions can very often reflect the life quality of a place at a certain time. The society’s requirements on a public space are primarily based on whether it can satisfy the needs of the general public. 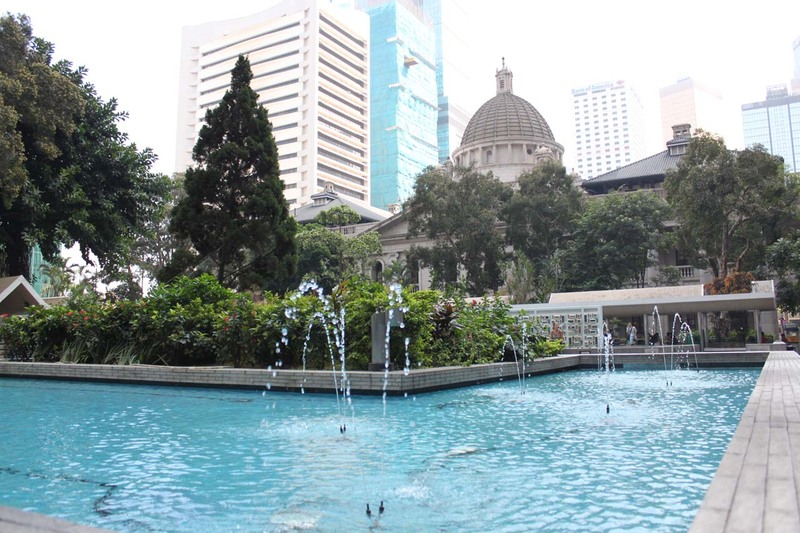 While the definition of “ideal public space”, for sure, varies among different people, below we would like to present the general framework of how a successful public space can be like, based on four main criteria HKPSI has identified. Every single person, regardless of age, skin color or social status, should have the right to access to public space. Accessibility is the best measurement on this aspect. An ideal public space should be as “open” as possible, including convenient geographical location, availability of transport links, high visibility to the public, clear entrance and the provision of barrier-free access1, in order to ensure everyone in society can enjoy the public space without difficulty. As such, the design and management of a public space should not restrict or discourage the entry of certain people, such as locking it up, locating in a remote location or designing an entrance that is concealed by other features. Public spaces, in which many people’s daily activities take place, should provide good-quality facilities. Features such as seating, lighting, running paths, shading and water are all good examples of what would make a public space allures people to visit. Appropriate recreational facilities and performance venues can also help attract people to stay for a longer period of time. In contrast, a public space that is too dark, self-enclosed or unsanitary is likely to deter people away from visiting it. In fact, safety, hygiene and comfort are all important factors that people pay attention to when deciding whether to visit a public space. Therefore, in order to help facilitate people’s activities, appropriate facilities and comfortable environment should be provided in public space. The term “public utilization” is a combination of two words. A public space should not only be well used, it must be well utilized by the public, but not just a particular group of people. The term “utilization” is used here because people do not use the space; they utilize the space to enable their public life. Hence, as the stages for public life, public spaces should be able to facilitate users’ intended activities, thereby becoming a “place” instead of merely a “space” (i.e. the concept of “Placemaking”2). Achieving this most of the time largely depends on the design and management. As such, design and management of public space should be flexible and people-oriented. In fact, public space resembles the blood capillaries of a city, bringing nutrients to different parts and connecting them with life. An ideal public space does not have to be filled with thousands of people, nor be extremely big in size, but it is normally vibrant, well utilized and free of intervention. From the historical perspective, public space is often the social stage for the public to voice out opinions. Nowadays, as the social network in the internet is dominating the social life of many, the significance of public space as a place for physical social life is becoming even more prominent. A successful public space should facilitate social interactions among people through accommodating voices of people from all walks of life, eliminating obstructions that discourage interactions, providing venues for performances, exhibitions and recreational activities which all encourage sociability, etc. Sociability is the realization of public life, and as such we can determine the success of public space by measuring the level of social interactions all around. How to construct a successful public space is an important issue for the government3, and the answer very much lies on what the general public wants. With collaboration by all different parties of society, Hong Kong will definitely see more good public spaces in the future. Equal Opportunities Commission (2010). Official Research Report on Barrier-free Access & Facilities in Public Access Areas, March [Chinese only]. Lefebvre, H. (1974) [translated 1991 by D. Nicholson-Smith] The Production of Space, Cambridge: Blackwell. Hong Kong Planning Department (2011). Hong Kong Planning Standards & Guidelines.Retrieved 20th July 2011. 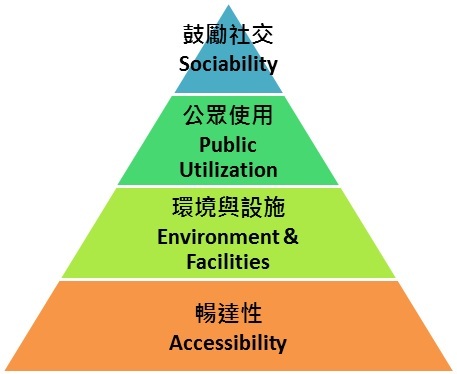 An ideal public should possess four main qualities, of which accessibility is the first step, because people need to gain access to public space in order to enjoy the environment and facilities, which is the second level. However, even with facilities, without appropriate design, a public space may not still enjoy public utilization. Going further, if a public space is well utilized by the public, but if everyone is carrying out individual activity, they are all just living in their own world. As such, a public space needs to possess high level of sociability in order to be deemed successful, because social interactions are the best demonstration of public life. To summarize, an ideal public space should not lack any of these four qualities. Nevertheless, this is a step-by-step process; it must first possess the first quality in order to obtain the second, and so on. 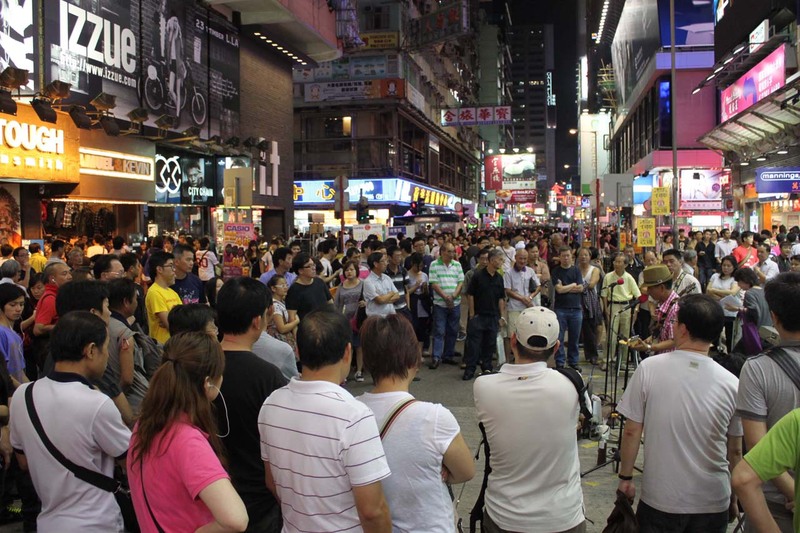 The level of social interactions is an important indicator of public life; the pedestrian area in Mongkok during evenings is a good example of sociability.